July has been quite a long winded month, but I still feel strange welcoming August into my life. August usually means that the Summer is coming to an end and that I need to start buying school supplies ASAP before all the good school bags are gone.. happens every year! July has been quite a dull month beauty wise, as I haven't really been buying much makeup lately. I need some new revolutionary product to come into my life! I've read a good few books and discovered new music artists galore, so I've scraped together my July favourites to share with you all. ♥ Urban Decay Naked eyeshadow palette- One product I've been using religiously over the past few months in the renowned Naked palette. I know, I know- this palette is plastered over the majority of beauty blogs out there, which is why I've held off mentioning it for a while now! That said, it's definitely worth the hype in my eyes. I love using 'virgin' as a highlighter too. ♥ No7 Beautiful Skin Day Cream- I'd been on the hunt for a new moisturiser for a while, and randomly decided to buy this pot of joy with a No7 voucher I had. I'm a big No7 fan- the products aren't too pricey, but work wonders for my skin. It's quite light but also leaves the skin slightly matte which is perfect for my combination skin. ♥ Oriflame Volume Blast mascara*- I was given this to try out at an event, so I've been testing it over the past month. In all honesty, I don't agree that it makes my lashes very voluminous at all- but it certainly lengthens them! I particularly like using this on my bottom lashes, because I like thick top lashes but spidery bottom ones. ♥ Catrice Smokey Eyes pencil- I've had this eyeliner for quite some time now, but I've only rediscovered my love for it this month! I really like the grunge-y, messy smokey eye trend that's been doing the works lately, and this pencil is perfectly smudgeable. Book Of The Month: July's book of the month is Lola And The Boy Next Door by Stephanie Perkins. I absolutely adored this book! I read Stephanie's first book, Anna And The French Kiss last year and it's honestly one of the best books I've read. Although I still prefer Anna, Lola And The Boy Next Door still blew me away. Stephanie's brilliant style of writing mixed with her loveable characters makes a truly good book. The books are slightly interlinked, but you can read them in any order, if you want. This book is about a costume loving teen called Lola as she battles a choice between her rockstar boyfriend and her quirky neighbour next door. That's all I'm going to say! I can't wait for Isla And The Happily Ever After now. Album Of The Month: I first discovered Glasgow-born band Honeyblood on Twitter, and their album highly impressed me. They remind me of The Runaways with a bit of First Aid Kit and Haim- a perfect combination for the ears, if I do say so myself! Their debut self-titled album has been on repeat on Spotify for me since it was released. Do, give them a listen! What have you been loving this month? What do you think of my favourites? Items marked with a * were sent to me for consideration. All views are my own! Read my full disclaimer here. 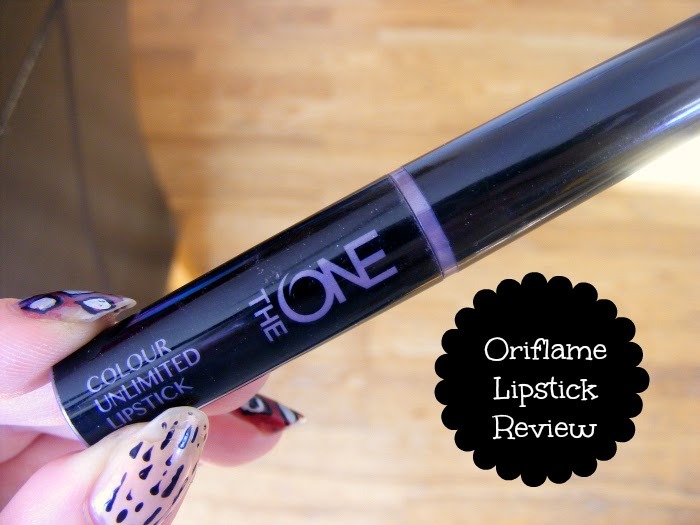 I recently attended the launch of the new collection, 'The One' by Swedish brand Oriflame (read about it here), and was given this lipstick* to try. I must admit, at first I was a bit wary- simply because I didn't know a lot about the brand. But hey, that's one of the perks of blogging, right? Through my blog, I've discovered so many wonderful brands I never would have found without it! Oriflame was actually founded in 1967 by two brothers, and it's now sold in over 60 countries. A lot of the selling is done by direct sales (i.e from door to door) but you can also buy their products online here. The Colour Unlimited Lipstick* in particular comes in 10 shades, and I was given the shade 'mocha intensity' to put to test. Don't let the name fool you- it's actually what I would describe as a soft plum with gold shimmer running through it. In all honesty, I've never been too fond of shimmer lipsticks, and usually go for something more matte. However, after trying this lipstick I must admit that my opinion has changed! 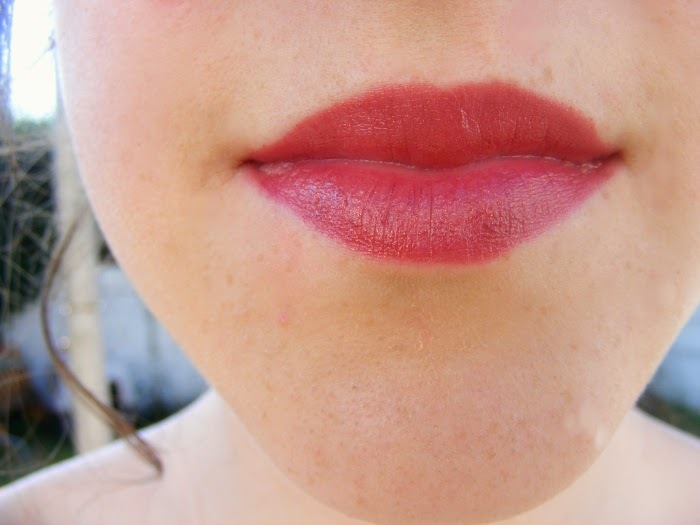 Once applied, the gold within it makes your lips look almost 3D and a lot more plump. 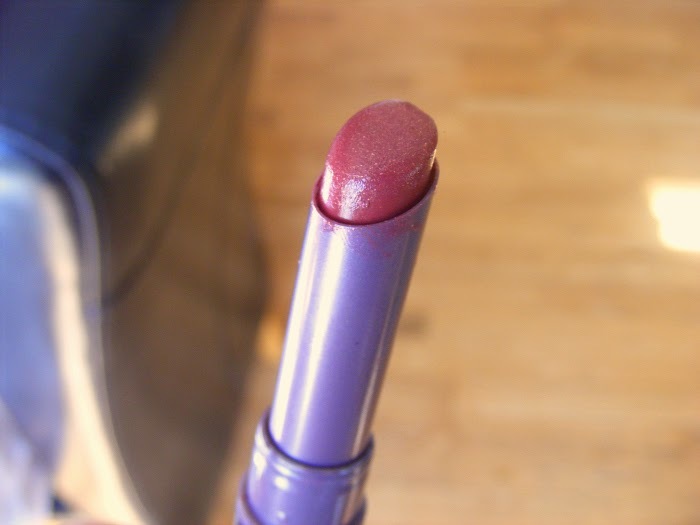 The lipstick comes in a very narrow tube, which is unusual seeing as lipstick is typically a lot wider, but the narrow head makes it very easy to apply, as you can reach every corner. It's very moisturising, and has a lovely berry taste (something I realise mightn't suit everyone's fancy!). Durability wise, it's not the most long lasting lipstick I've tried, but I can't complain as I love the colour so much! I don't actually own any lipsticks this colour, and it's quite unlike any berry shade I've tried before- and trust me, I've tried alot. You can buy the Oriflame Colour Unlimited lipstick* here for €13.95. Have you tried anything by Oriflame before? If you have any product recommendations, leave them below! Items marked with a * were sent to me for consideration. All views are my own! Read my full disclaimer here. Something I get asked quite a lot by friends and strangers a like, is how to get started on writing a blog. First up- I'm no expert. My blog is my hobby, but I've been writing it for over a year and a half now, believe it or not! There are times when I regret not starting it differently, or wish I knew certain pieces of information before starting mine. That being said, my life has been so much better since starting my blog! It's opened so many doors for me, and I've made some lovely new friends. Not only that, but my writing has definitely improved, along with my photography and graphic design! Here are my top 5 tips: ~ 1. Start TODAY- If you're considering making a blog, try to to start it as soon as possible. If you're eager to start, you'll be eager to continue! Although it's your blog, and you can post when you like, it's best to start some regularity from the start. When you have a free day, sit down and jot down some ideas about what you'd like the name to be. Think about what you'd like to blog about too. My name is quite general as I didn't want to be tied down to one subject! Make sure your name is available, and look for some free themes online. 2. Create social media accounts for your blog- I personally believe a blogger's social media presence can say a lot about them as a person, and it's nice to know a blogger behind the blog! Create a twitter, instagram and/or facebook account using your blog name or something similar. Mine are all 'oh hey there rachel', minus my twitter account (0mgrachel) as it was too long! 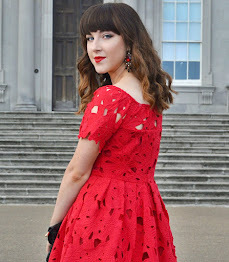 If you're thinking of creating a fashion blog, I highly recommend heartifb.com as it has some brilliant tips and its great for connecting with other bloggers. 3. Participate in twitter chats- This is partially linked to my second tip. There are weekly blog chats on twitter for numerous different topics, and its great for sharing your link, finding new blogs/brands to connect with and learning new tips! There's a calendar of some of the chats on this blog here. 4. Spell check!- Have a read through your post before publishing it, as you might have accidentally misspelled something along the way. We all have mishaps, heck I've probably got a good few running through my blog, but it's hard to read something with bad grammar! 5. Be yourself- This is one is probably a bit of an obvious one, but I felt the need to say it! Try to make your content as unique as possible. We can all gain inspiration from one another, but there's only so many reviews of the Naked palette one can read! ~ So there you have it! My top 5 tips. 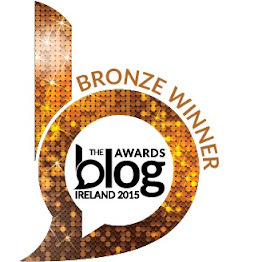 Please remember, there are no real rules to blogging- you make the rules! I hope these tips help someone. If you've recently made a blog, leave your link below and I'll definitely check it out. Hey everyone, After a long week visiting my sister in hospital, it was a nice surprise to receive an email from Lavish Alice* asking if I would like to review an item from their website. 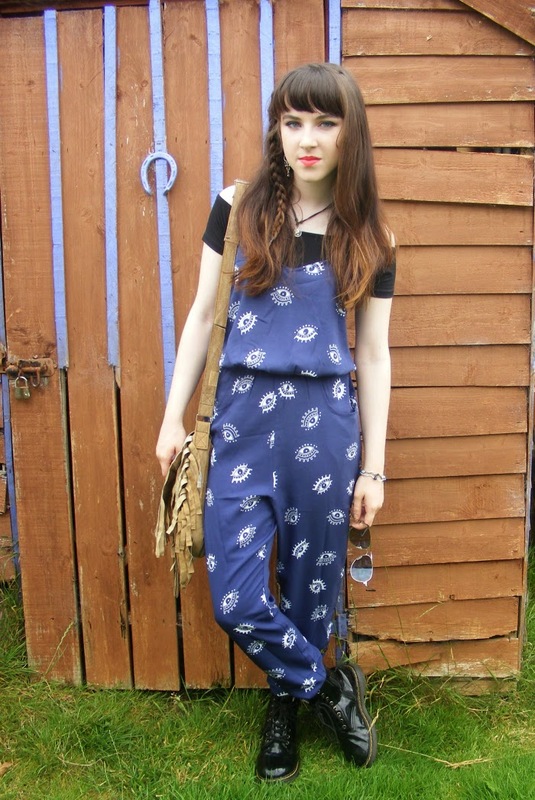 I chose this quirky eye printed jumpsuit, as I'd been wanting to try a jumpsuit out for ages, and I knew it would serve me well at the music festival Longitude- and so it did! 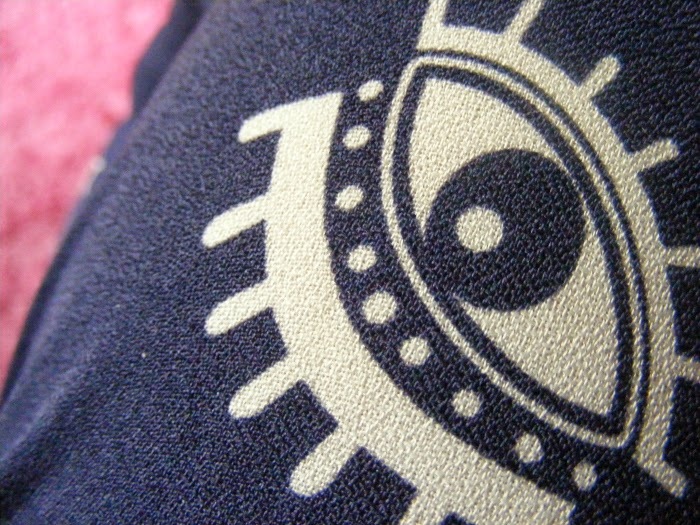 Their delivery was incredibly fast, and I'm highly impressed with the quality of the material. I also thought it was super cute how the label said 'try me', like on the magic cake in Alive In Wonderland-such a nice little touch! Longitude was a pretty amazing experience, I can tell you that much! 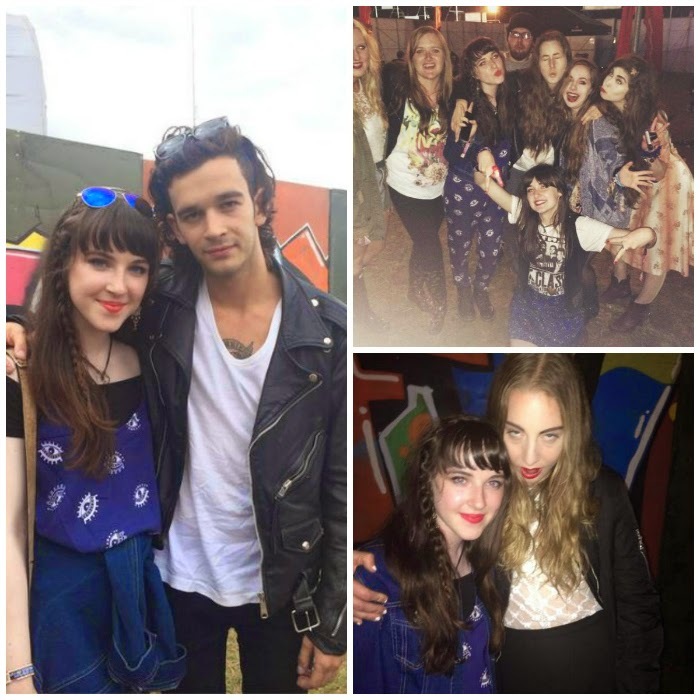 My friends and I were lucky enough to be on the guestlist, so I got to hang out with Haim again and also bumped into Matt Healy from The 1975. Twice. It was my first time at a music festival, and I can definitely see the attraction now! Although I only went for a day, I plan to go to a lot more festivals next year. Este, Haim's epic bass player, complimented my jumpsuit too and asked me where I got it, which I'm sure Lavish Alice* will be delighted to hear! 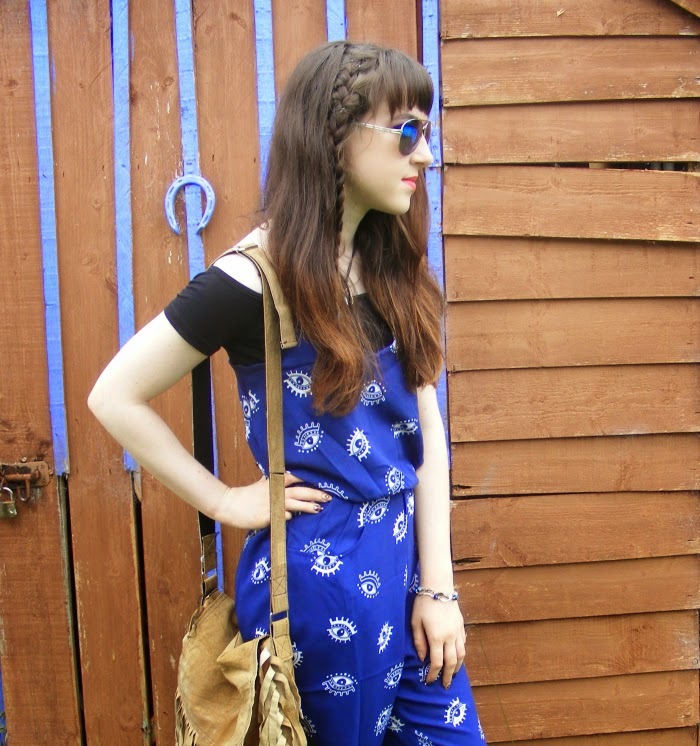 Jumpsuit- Lavish Alice* Off the shoulder top [underneath]- Penneys/Primark Shoes- Dr. Martens Sunglasses- Tiger Bag- Om Diva Earrings- Cotton Face Bracelets- Newbridge Silverware & vintage ..and some snaps from the festival! Have you been to any music festivals this Summer? Items marked with a * were sent to me for consideration. All views are my own! Read my full disclaimer here. 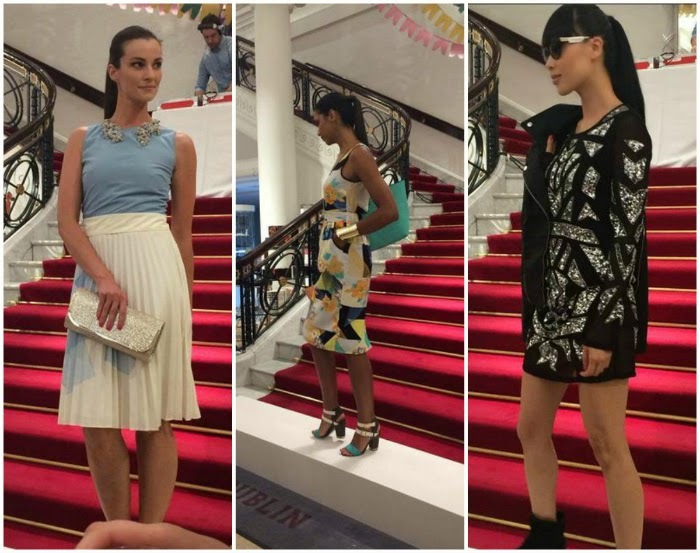 I was recently invited to a fun-filled fashion and beauty event at one of Ireland's largest department stores, Clerys. It was a really chill evening and as I had a plus one, my mam was delighted to come with me! I got my skin analysed by MyChelle (time to start wearing more suncream..), a delightful eye massage and plenty of yummy treats! My mam also had her nails painted by Magda from the Nail bar and she loved them, so I promised I'd give her a little shout out. 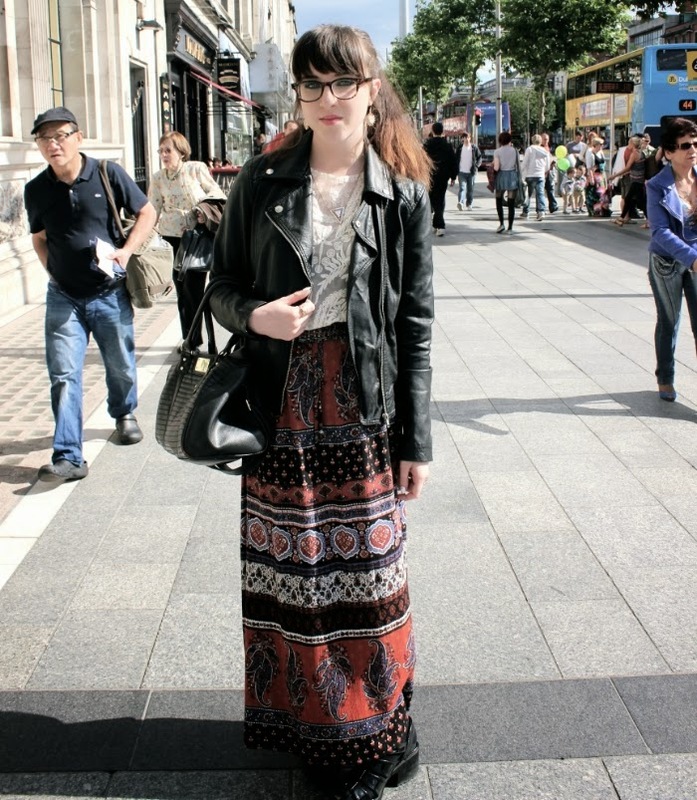 For the event, I wore my dreamy new vintage skirt from Om Diva. 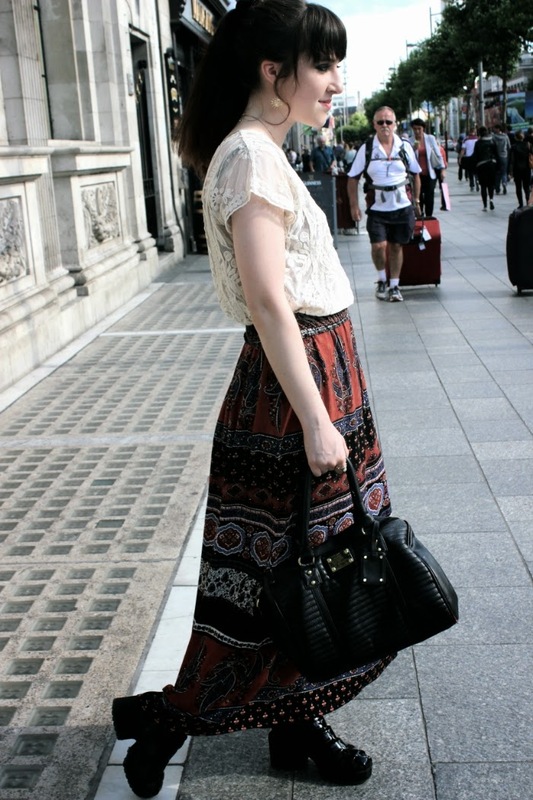 I fell in love with the skirt the moment I saw it- it just screams 'Summer' to me! Although it's a tiny bit tight, I'm going to squeeze into it regardless because I absolutely adore it. Some snaps from the event! Have you ever fallen head over in heels in love with an item of clothing? I think I have! Items marked with a * were sent to me for consideration. All views are my own! Read my full disclaimer here. 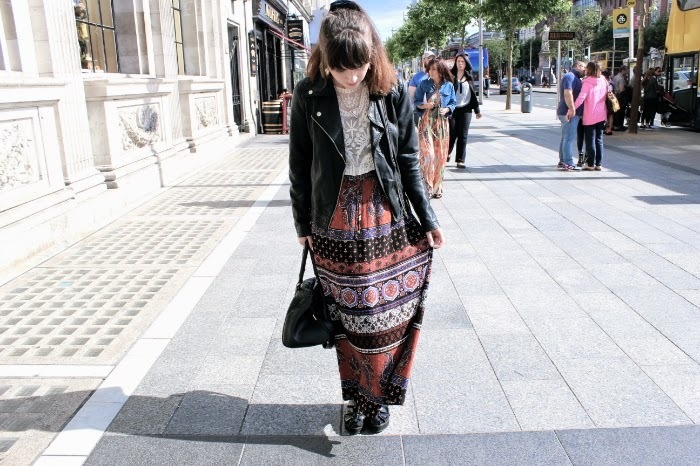 OOTD- Dreamy Skirts & The Clery's Carnival! As soon as Summer comes around, there's the dreaded realisation that your legs are as white as a sheet and you haven't shaved your legs in months (if you're anything like me anyways!). First up, I'm gonna talk about the colour. This can be alterted easily enough with fake tan or gradual tanner. I highly recommend the Dove gradual tanner, as you can reapply it daily for a natural glow. To avoid looking like a streaky mess, I would suggest exfoliating and shaving a day or two before. This is just so the tan doesn't seep into your open pores and give you brown spots.It also helps if you moisturise your legs really well, particularly your knees and ankles. I'm not going to lie- I'm not a big fan of false tan at all, and a gradual tanner is about as much tan as you'll get on me! Now on to the hair removal part- there are a few different options for this! I personally use a razor, which does the job but means continuous touch ups. Waxing is another option, although believe it or not I've never used wax before! The third option is laser hair removal, and sk:n clinics seem to offer a brilliant option. Sk:n have been around for 20 years, working with experienced doctors and staff to make your skin feel better. Laser hair removal is a popular choice in their clinics. In all honesty, I've never tried it either, but after doing some research it sounds like the best option! It works by focusing a laser beam at the hair follicle which stops any growth. It can be used on any part of the body too! They recommend 6 sessions every 6 weeks to get maximum benefit. 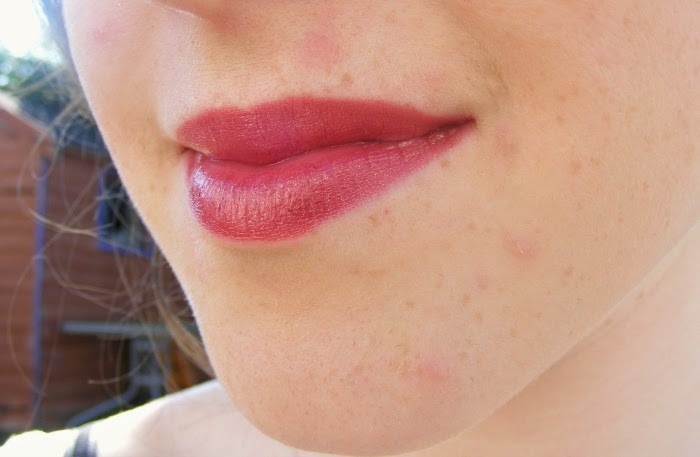 At sk:n, you can book a free consultation, and they also conduct a patch test for your safety. It's a damn pity they have no clinics in Ireland so the options out for me unfortunately, but if you're from the UK you can locate your nearest clinic here. Have you ever tried laser hair removal? What are your top tips for smooth pins? Struggling To Get Smooth Summer Legs? Try Laser Hair Removal! Zoë (who lets be honest, is absolutely great in every way and totally didn't write this) kindly took outfit pictures for me a few days ago on her swanky camera, after the Oriflame event. 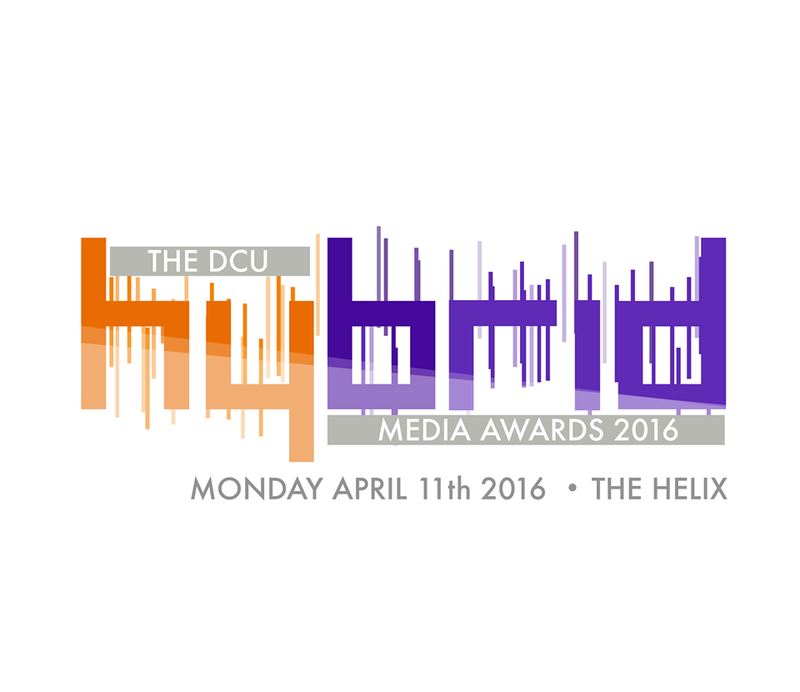 The event was brilliant, and I wrote a full post on it here! I got my eye makeup done at the event by celebrity makeup artist Gary Cockerill, hence the smokey green eyes in these images. I've actually never properly gotten my makeup done professionally before, well not that I can remember anyways! If only I was able to recreate such a beautiful look everyday, but unfortunately my makeup skills aren't as good as his. I feel like my style changes a lot with the season, and I honestly just wear what I'm in the mood for! 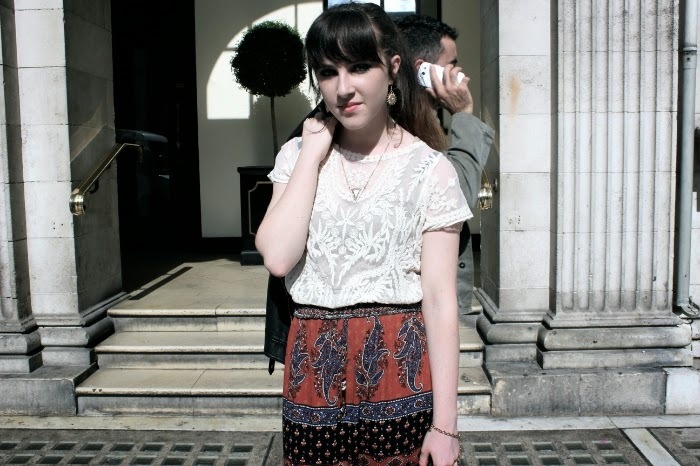 On this particular day, I was feeling particularly 'boho'. 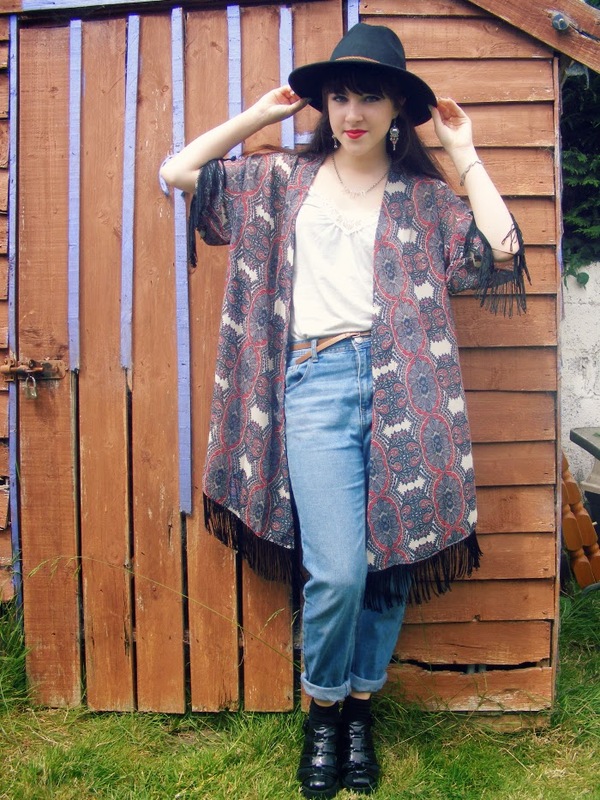 I've been loving festival style lately, and I feel I'd be ready to go to a festival in this outfit, if I was asked! 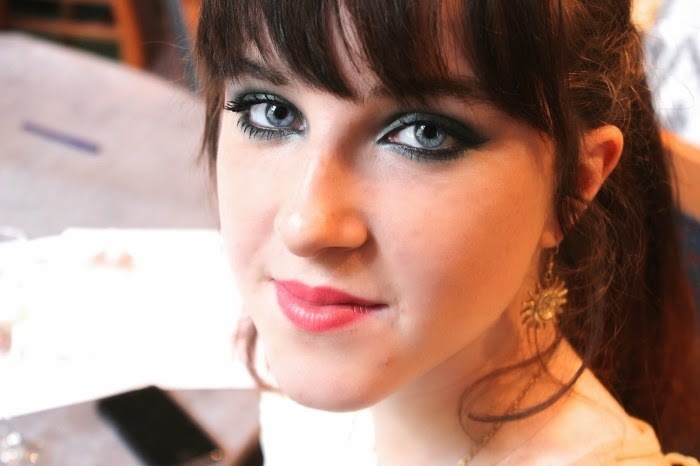 Have you ever gotten your makeup done professionally? 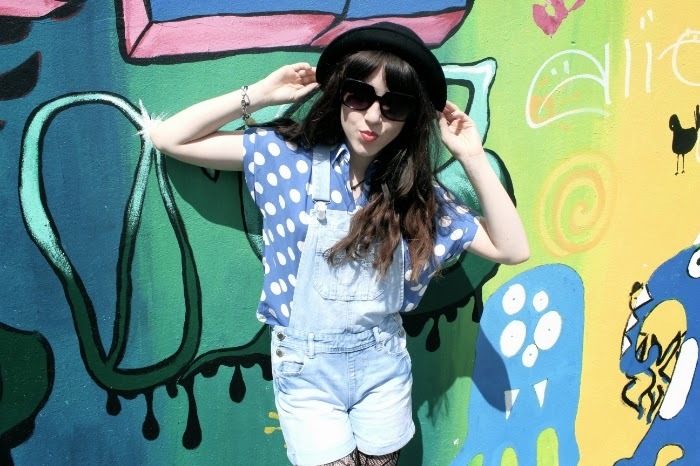 Hey everyone, As you can probably tell from a lot of my outfit posts- I love vintage clothes. 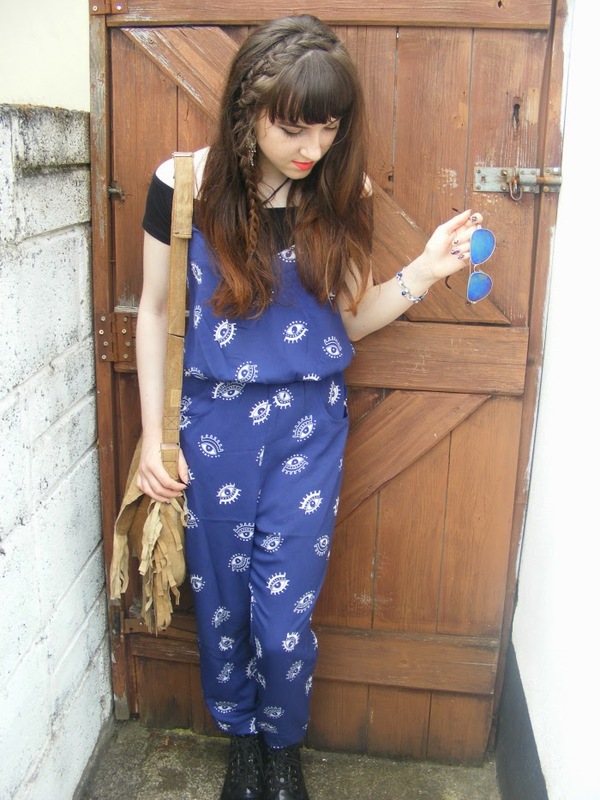 My recent post about my favourite vintage shops went down a treat! I personally love everything about vintage clothing, and I always wonder who wore the item before me. Were they in love? Or maybe a celebrity? Where did they wear the item of clothing to? What a lot of people don't realise is that we're constantly taking inspiration from the past, and many shops are rebooting vintage style clothes. However, I know that a lot of people cringe at the thought of wearing pre-loved clothes, or the idea of rummaging through racks makes them want to run back out! I can assure you now that none of the vintage clothes I own smell like dust or are in horrible condition- quite the opposite actually! I will admit, there are times when I come out empty handed. It's not easy! 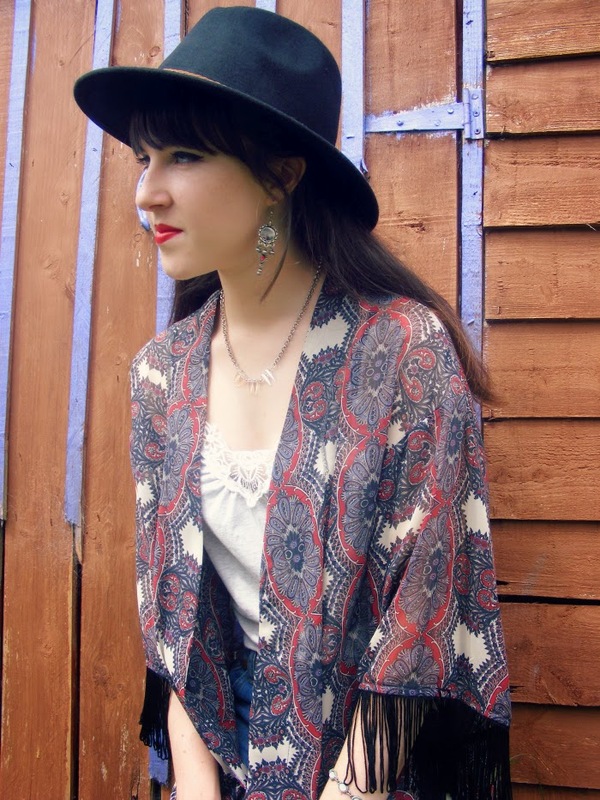 Here are my top tips for shopping for vintage clothing, and how to incorporate vintage into your wardrobe. ~ •Take your time-Vintage shopping can take a bit longer because everything is one of a kind. It might take a while to sort through the rail, but who knows what you might find! •Start out small-Whether it's a belt, skirt or a handbag, you don't have to dress head to toe in vintage! 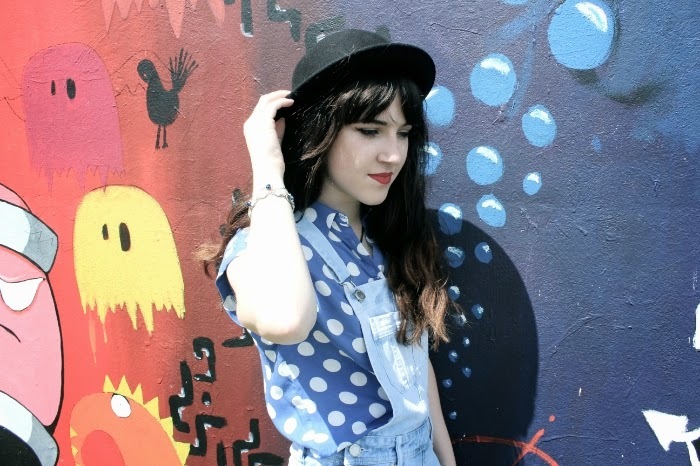 I like to incorporate vintage and highstreet for a modern twist on classic outfits. 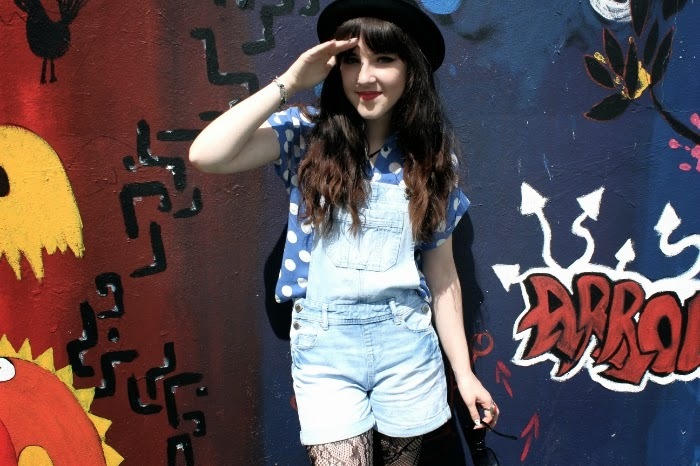 •Do your research- Have a look on pinterest or tumblr under the 'vintage fashion' tag for ideas. If you have an idea in your head as to what eras or style you like, it's generally easier. •Keep up to date- Look up vintage shops in your area [or check out my favourites here] and give them a like on facebook. 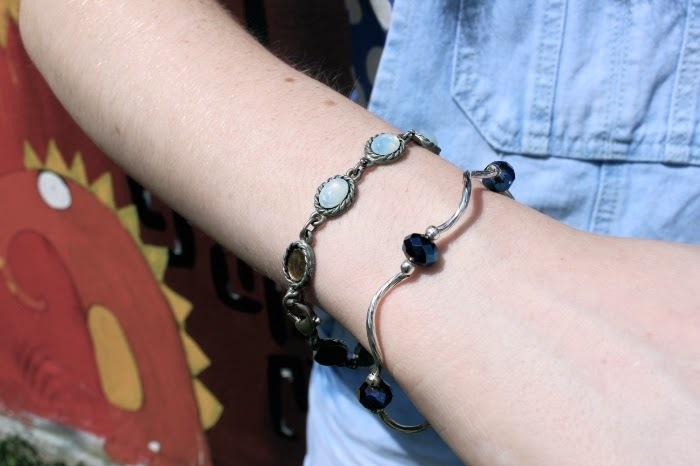 Vintage shopping can be a bit pricey depending where you shop, but many vintage shops have regular sales to get rid of old stock- just like the highstreet! •Don't be scared- Rather than turning your nose up at the next flea market or vintage shop you pass, pop in and have a look! Even if you see something you're not particularly keen on, think of ways you could alter it to suit you. So there you have it! My top 5 tips. I wish you all the best with your vintage shopping! 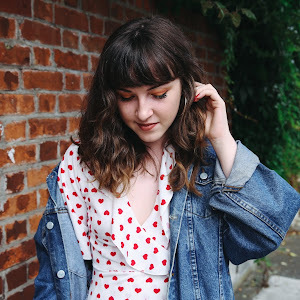 I'm thinking of doing more vintage-esque styling posts so do let me know if there's any era's in particular you would like to see, let me know. P.S- 'This Old Thing' on Channel 4 by Dawn O'Porter is a great TV show with so many helpful tips! 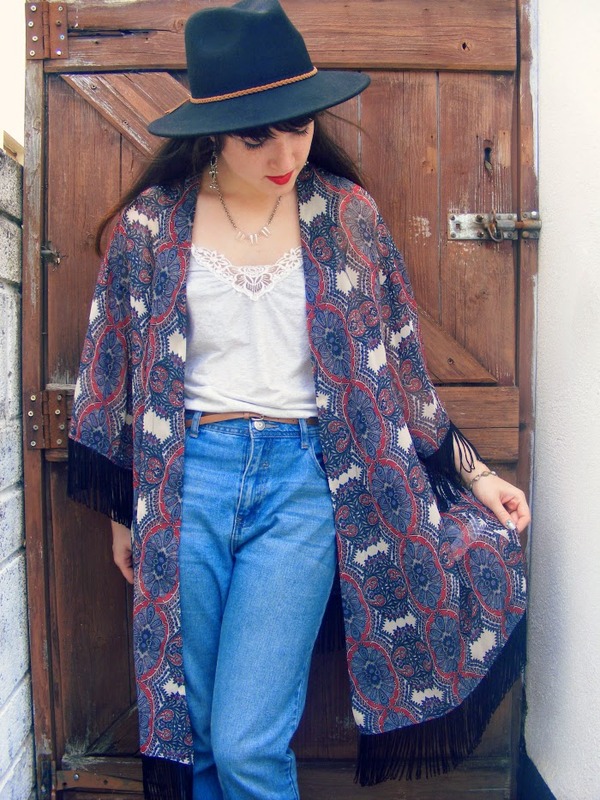 Vintage Shopping- Where To Start & Top Tips! 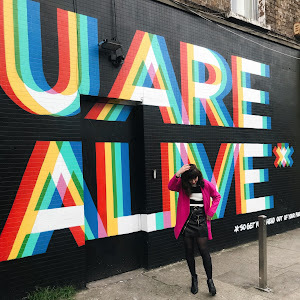 These images were taken by Zoë during my trip to Cork, and I had to share them with you! My stay down South was lovely, but I do admit that it's nice to be home. There's just something extra special about sleeping in your own bed, after days away from the house! I'm seriously envy of the image quality, and it's definitely encouraging me to save up for a new camera. Although blogging isn't really about expensive cameras and good software, I like to constantly improve, and my camera could do with an upgrade! 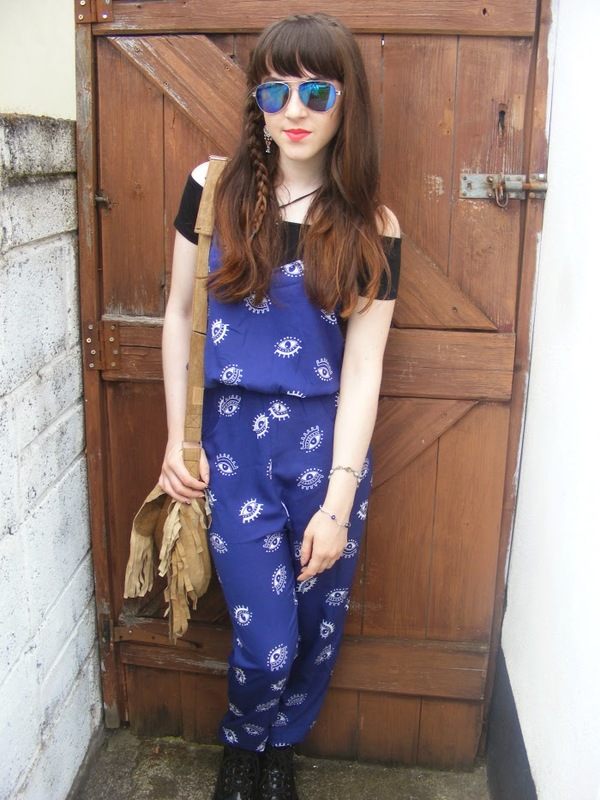 I picked up these super cute dungarees and the shirt in the New Look sale (which, by the way, is uh-mazing) and from the moment I saw them, I knew they would look good together. I realise you can't see my shoes in these pictures, but they were just my usual chunky-soled black sneakers (sneakers= super American, I know!). Unfortunately for me, my favourite pair of sunglasses broke, so I threw on the only pair I could find in the house, which aren't particularly suited to my face shape..
Are any of you going on holidays this year? Do you agree, that returning to your own bed is definitely one of life's finest moments? Please do leave your thoughts below! 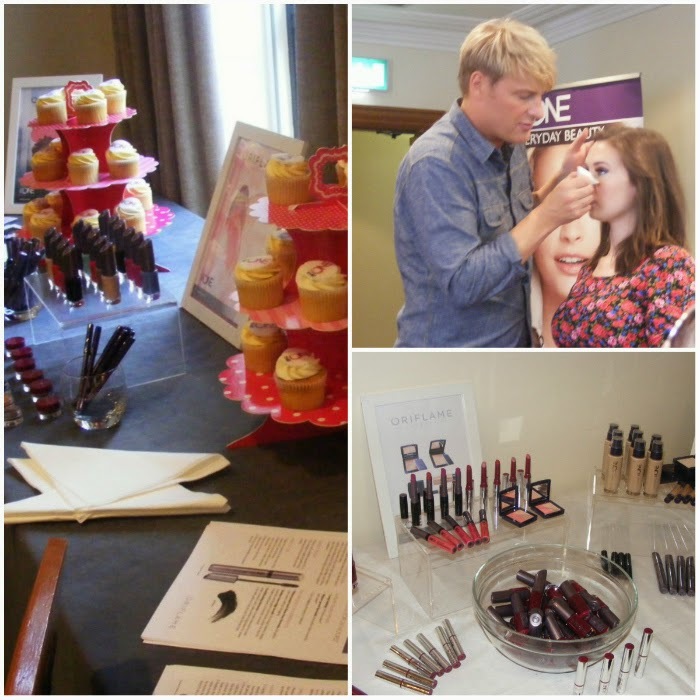 I was recently invited to the launch of Swedish brand Oriflame's new collection, The One. Although I had heard many a good thing about Oriflame before, in all honesty- they weren't a brand I knew a lot about. Believe it or not, the company was founded in 1967 by two brothers and their products are sold door to door in over 60 countries! You can also buy their products online here. We were greeted at the event with cupcakes and prosecco, which is always a good way to start things off! The event took place in The Gresham, an elegant hotel in Dublin city. There was a lovely relaxed feel at the event, which was brilliant as some events can feel a bit formal. The most anticipated part was the arrival of celebrity makeup artist Gary Cockerill, who's transformed the likes of Eva Longoria, Katie Price and David Beckham! I was honoured to be chosen to be the model for the demonstration, and Gary chose to do a deep emerald smokey eye. It's not something I'd usually wear, but the final look was gorgeous! He also demonstrated on fellow blogger Beth, so I definitely picked up some new tricks. I'm looking forward to trying out the range now, and you can expect a full review ASAP. Have you ever tried Oriflame? Check out their products online here! So I FINALLY got around to doing some shopping- and by god, did I need some retail therapy! I've been on the lookout for a cheap black fedora for months now, and I was considering buying one on eBay, but luckily enough I came across this one in Penneys for €8. 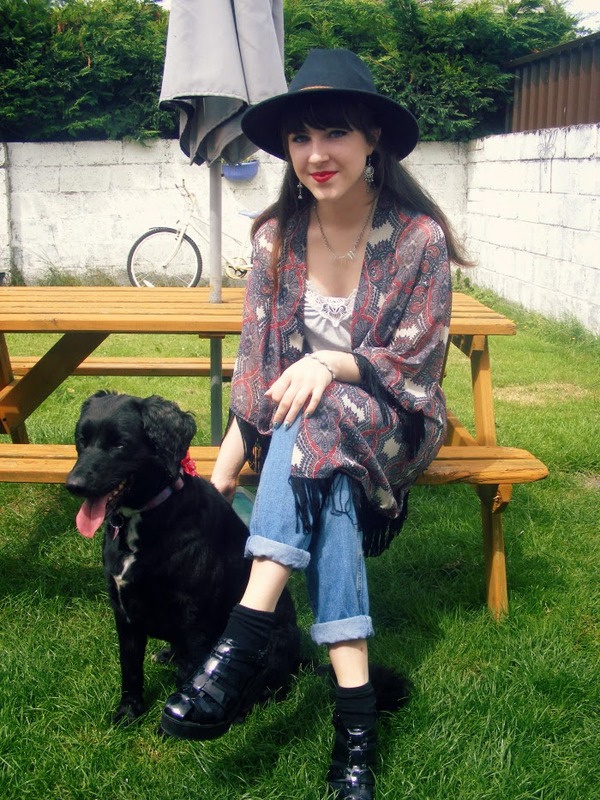 My outfit is mostly Penneys actually- they're really picked up their game in my opinion! 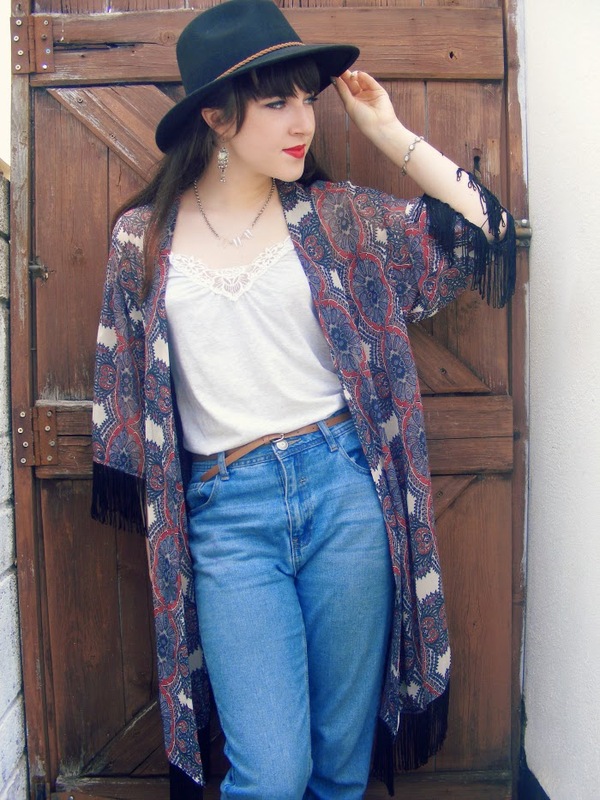 I also found the perfect kimono with fringing for €15. 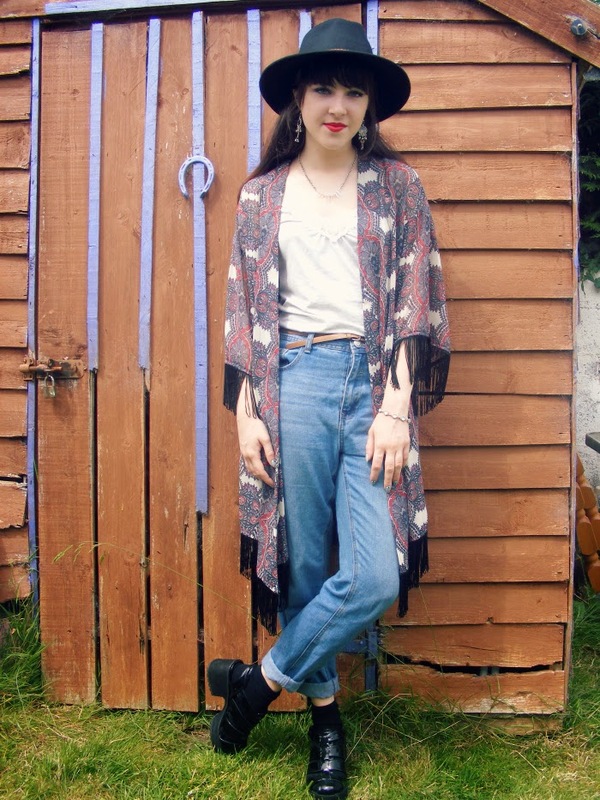 I'm very particular with my kimonos! 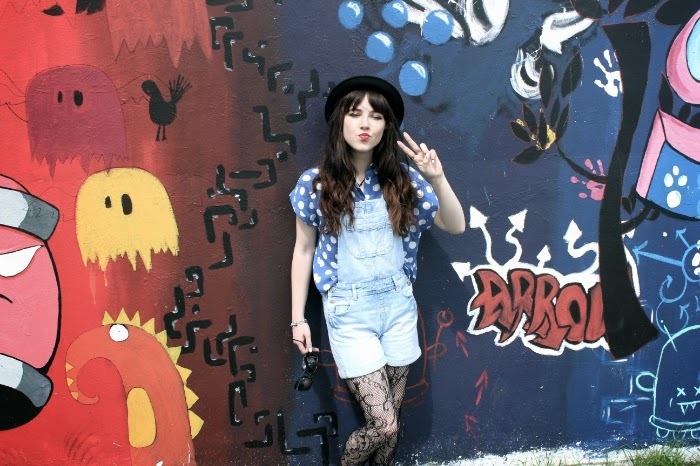 I wore this outfit on a family day out [to do some more shopping, believe it or not]. I'm heading down to visit my good friend Zoë from Zoe With Umlauts today for a couple of days, and I'm super excited! It's going to be a weekend filled with fun blogging activities, that's for sure. It will also be nice to visit the south of Ireland, as I haven't been down there in years.Although it's only a few days away from home, it might be the only holiday I get this year. My sister is heading in for her second spinal operation on Monday, so fingers crossed it goes well. Are you going anywhere on holidays this year?